Tile is not the only thing important on your tile floors. Make sure that you have a professional grout cleaning done at the same time. Grout Rhino will scrub the grout in between the tiles of your floor to bring out the same clean look that it had when it was first put down. Over time, the grout will begin to look dingy, and the grout color will yellow from wear and tear. Get the whole grout in your house cleaned and pampered and save money. Grout, which is very porous, collects dirt, grime and spills, often discoloring the surface. Regular mopping and spot cleaning won’t reach the hidden dirt that lies deep within the pores of your grout lines. Contact Tampa Grout Cleaning company Grout Rhino for tile and grout cleaning and sealing in Tampa Bay Area. Our state of the art grout cleaning system will extract dirt from deep within the tile and the pores of the grout. Schedule your free in-home Grout Cleaning estimate today. Grout lines are notoriously difficult to clean. Every homeowner (and business owner!) knows that regular mopping, home tile cleaners and home grout cleaning methods just don’t do the trick, especially if you’re trying to eliminate stubborn dirt that has settled on deep into grout lines. 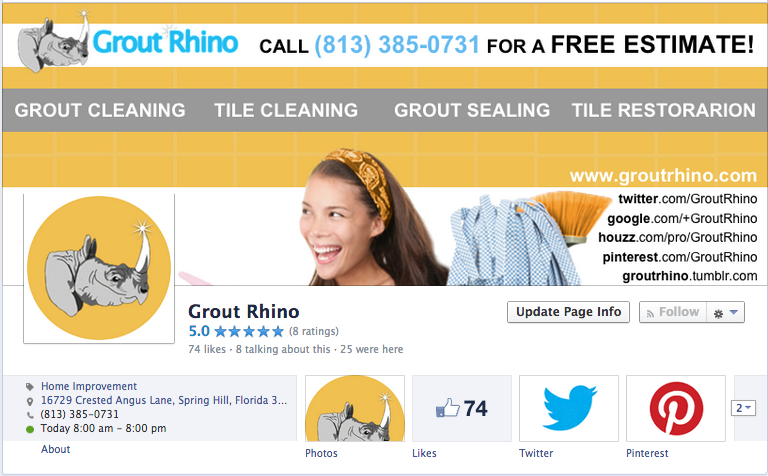 Call Grout Rhino, Tampa Grout Cleaning Company, and we’ll come to the rescue! Grout Rhino’s professional Tile Cleaning and Grout Cleaning process will keep your tile surfaces, grout lines, countertops and backsplash clean and fresh. We can boldly go where bottled cleaners and household mops have never gone before! “Very professional service and would definitely recommend. Giuseppe came in, gave us a quote and stuck by it when he came back to do the tiles the following week. We had the tiles cleaned and the grout refreshed. It looks like new”. Call us today to request your FREE Grout Cleaning ESTIMATE at (203) 273-6803. You may also reach us by using the Contact Form in the side bar of our website. We look forward to hearing from you!